Hey y'all! I can't believe it's October already, man this year has just flown by. It's hard to believe that a year ago very few people ever read this blog, I had never done a giveaway, and I was just starting my journey with Foodbuzz. This year has been so amazing! And to top it off, this year included me experimenting with possibly my new favorite soup. Chicken Tortilla Soup! I've made a few versions of this soup over the last year all were good... But none were great until this one! And would you know, this is the first one I completely created on my own. I've been working on this recipe for awhile because I knew what I was wanting it to taste like, just not entirely sure how to create this. Finally a few days ago I got it just right! Some of you who follow me on Facebook may already know that my family has been hit by this cold going around. And let me tell you it has not been fun. My poor little sous chef got hit with it so fast I was blindsided, and was pretty miserable for a couple of days. He is finally on the mend, but now my wonderful Hubby has caught it, think there's a chance I will escape this? I'm doubtful but one can still hope! Anyway, this soup has been fantastic to us with sinus problems, it's just spicy enough to get everything flowing, but not too spicy that my little guy wouldn't eat it. And I'm so glad for that, he slept so wonderful the night I made this and woke up feeling so much better! Ah the wonders of Jalapeno... haha! I hope y'all will give this easy soup a try, it really is wonderful for this cold and flu season! Spray a large slow cooker with cooking spray. Place the chicken in the bottom of the pot, and add the broth and water. Then add the chopped onion, and the cans of tomatoes (if you can't find Fire Roasted Tomatoes, get a can of regular tomatoes and add 1-2 jalapenos diced, a small can of green chili's, diced and up the spices a bit.). Then drain and rinse the black beans, and add into the pot along with the spices and hot sauce. Cook on high for 6 hours. Once the chicken is fully cooked, take the chicken out of the pot and shred it, then add it back in. Then slice the corn tortilla's into strips about the size of noodles, and add to the soup. Stir well, this will help thicken the soup. At this point taste and see if you want/need any more spice. Then add in the cup of cheese, stir and serve warm with your choice of toppings. I must admit I LOVED this soup, so did my whole family! In fact I had a second serving as a snack later that night as it is pretty low in fat and calories and it was just so darn yummy! lol! I will be making this often! 5 stars. 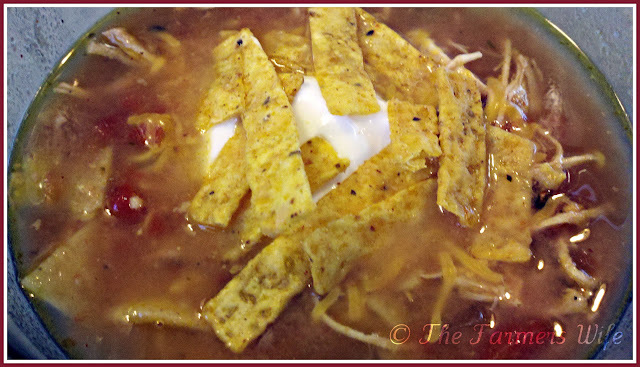 Tortilla soup is a wonderful comfort food when you are not feeling up to par or for cold weather. Yours does look tasty-yum! Sickness at the house does seem to make its rounds to every person-so I hope you do not have a bout with a nasty cold. Another hit, of course I wouldn't expect anything less than the BEST from ya, I can't wait to try this!!! What a good timing for me. I am thinking making soup for tonight's dinner and I found your post. This looks so yumm. I can see how this wonderful soup could help when you're sick and when you're not sick for that matter. Hope you all are feeling better. What a great soup! It is one of my favorites! We are going through the round of colds here too! This soup looks soooo good and comforting. Chicken Tortilla Soup is one of my absolute favorites. Looks good for an upcoming fall day!